Depending on how you look at it, we’re either one-third of the way through the Tour de France – because we’ve just arrived at the first rest day – or nearly halfway through it in terms of stages completed and total distance covered. However you choose to look at it, it’s been a pretty eventful race so far, so here’s a quick review of week one of the 2012 Tour in numbers. 10 – Stages completed, out of a total of 21. 1 – Summit finishes to date: La Planche des Belles Filles on stage seven. There are two still to come. 7 – Number of different stage winners: Peter Sagan (three), Andre Greipel (two), Fabian Cancellara, Mark Cavendish, Chris Froome, Thibaut Pinot and Bradley Wiggins. 5 – Number of teams to have registered a stage win: Liquigas-Cannondale (three), Sky (three), Lotto-Belisol (two), RadioShack-Nissan and FDJ-Big Mat. 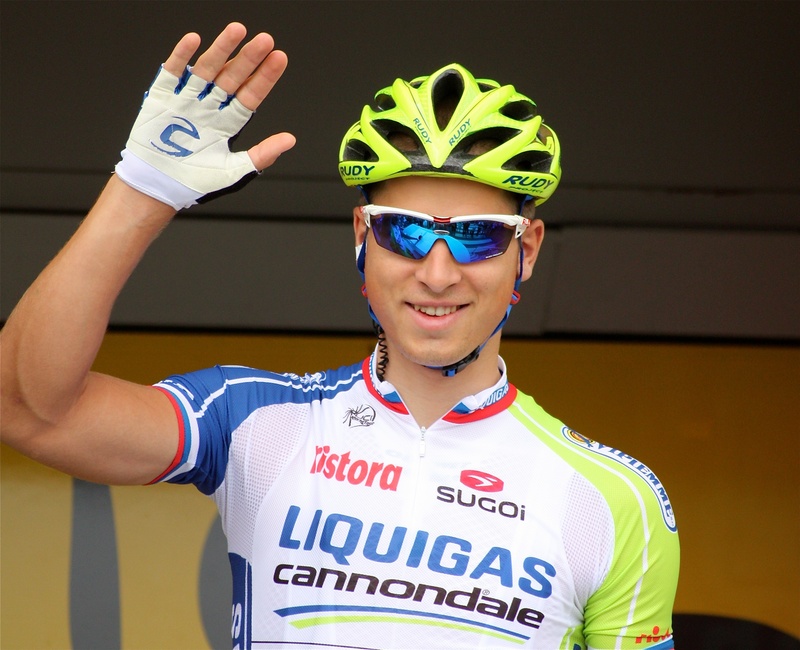 4 – Stages won by 22-year olds: Sagan (three), Pinot. 2 – Stages won by riders currently in the top 20 of the general classification: Froome (stage seven) and Wiggins (stage nine). 21 – Tour career wins for Mark Cavendish after his stage two victory. 16 – Peter Sagan‘s three victories to date take his 2012 win total to 16. 3 – For the first time ever, three British riders have won stages at the same Tour: Cavendish, Froome and Wiggins. 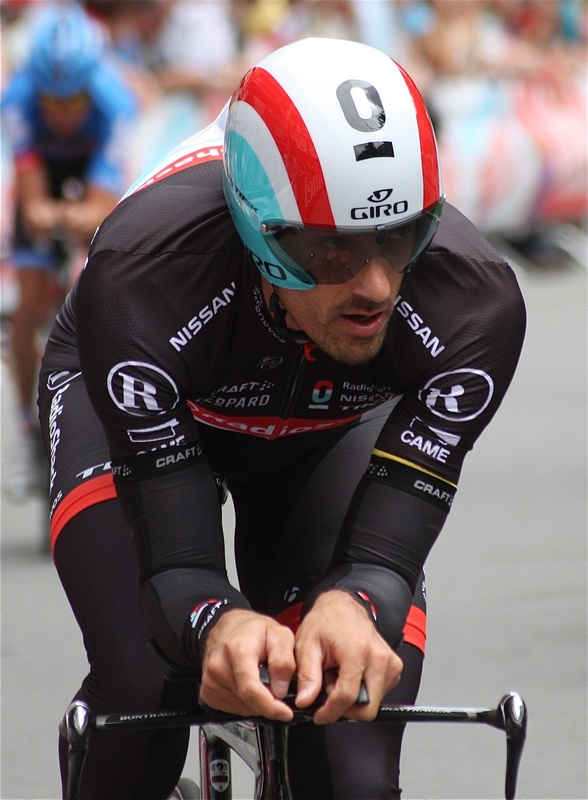 2 – Number of riders who have led the 2012 race: Fabian Cancellara (seven days) and Bradley Wiggins (three). 28 – Cancellara has now accumulated 28 days in yellow during his career – more than any non-overall winner, passing the record of Rene Vietto (26 days). 50 – Wiggins took the yellow jersey on stage seven on July 7th, one day after the 50th anniversary of the first British rider to claim the overall race lead: Tommy Simpson in 1962. 6 – Only six riders are within five minutes of the race leader in the general classification. A further six are between five and six minutes in arrears. 32 – Peter Sagan leads the green jersey competition with 217 points, 32 more than second-placed Matt Goss. He has led the classification since winning stage one. 6 – Saxo Bank-Tinkoff Bank’s Michael Morkov wore the King of the Mountains’ polka dot jersey for six days. 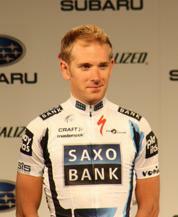 21 – Fredrik Kessiakoff (Astana) currently leads the mountains classification with 21 points. There are 27 points available on tomorrow’s stage alone. 42 – In seconds, Tejay van Garderen‘s advantage over Rein Taaramae in the young rider comperition. They are the only two riders to have worn the white jersey so far, although RadioShack’s Tony Gallopin is just three seconds behind Taaramae in third. 17 – Tour starts for BMC’s George Hincapie, a new record. 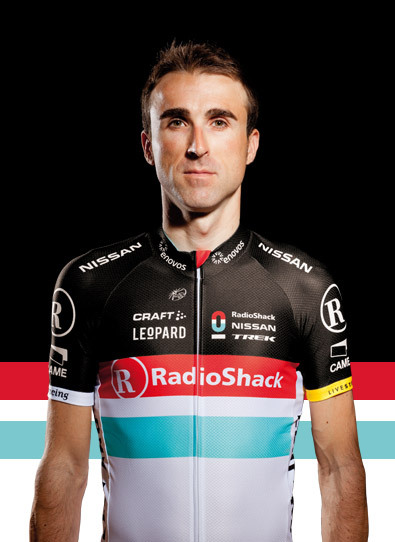 5 – Number of RadioShack-Nissan riders in the top 17 of the general classification: Haimar Zubeldia (sixth), Maxime Monfort (seventh), Tony Gallopin (13th), Andreas Kloden (15th) and Frank Schleck (17th). 23 – Since 2008, British riders have won 23 stages of the Tour (Cavendish 21, Wiggins and Froome one each) – only one fewer than between 1903 and 2007 . 21 – At the time of writing, there have been 21 abandonments from the race – this includes Tony Martin, who withdrew after yesterday’s time trial. 8 – Eight of the 21 riders to have quit the race are Spanish: Mikel Astarloza, Amets Txurruka, defending King of the Mountains Samuel Sanchez and Gorka Verdugo (all Euskaltel-Euskadi), J J Rojas, Imanol Erviti and Jose Ivan Gutierrez (all Movistar) and frmer green jersey and three-time world champion Oscar Freire (Katusha). Some data courtesy of Infostrada Sports. VeloVoices will bring you previews of each day’s stage every morning, live coverage of every stage on Twitter, reviews in the evening and in-depth analysis after selected stages. There may not have been any great changes in the GC after the difficult stage eight, but it was an unpredictable and exciting day in the saddle, narrowly won by FDJ’s Thibaut Pinot after a long breakaway. There were seven categorised climbs as the race rolled into Switzerland, with all the main GC contenders finishing together. Speaking of Swiss rolls, Samuel Sanchez took a tumble early on in the stage, rendering the Euskaltel-Euskadi rider unable to continue. In the land of the Red Cross, the Spaniard was carted off in an ambulance with a broken rib, collarbone and wrist. Sky worked as efficiently as a luxury timepiece in shutting down the opening breakaways, preventing the likes of Sylvain Chavanel (Omega Pharma-Quick Step), Philippe Gilbert (BMC), David Millar (Garmin-Sharp) and Jens Voigt (RadioShack-Nissan) gaining ground early on. Eventually a break did manage to create a gap, headed by last year’s most combative rider Jeremy Roy. FDJ’s Frenchman attacked alone, slipping away from the other escapees, before Astana’s Fredrik Kessiakoff managed to bridge across to the leader on the Côte de Saignelégier. But by the time the penultimate climb had come around, Roy had been dropped and Kessiakoff was all on his own. Liquigas had taken up the pace-making in the peloton, with RadioShack’s Tony Gallopin and FDJ’s Pinot dangling between the leader and the bunch. Kessiakoff’s lead to the maillot jaune had stabilised at around about three minutes, but on the final climb it was Pinot who he had to worry about. The gutsy FDJ rider attacked inside the final 20km, and by the time they reached the top he had caught and ridden straight by the Swede. All of a sudden the favourites were galvanised into picking up the pace, with first Vincenzo Nibali (Liquigas) and then Cadel Evans (BMC) both seeing whether they could make up time on the other GC contenders on the descent and flat run to the finish. Kessiakoff was caught, but would Pinot hold on? The gap had been rapidly closed down to under a minute, and he seemed to be running out of steam. Fortunately he could, taking the stage by 26 seconds, with the GC contenders coming across the line together behind him. This award has to go to stage winner Thibaut Pinot. FDJ’s young revolution continues, with Pinot – the youngest rider in this year’s race – taking his first Grand Tour victory at the age of 22. It was a heroic effort and the French outfit will have pleased their sponsors in fulfilling their stage win hopes already. His palmares – which includes a mountains classification win in the 2010 Tour de Romandie – suggests that he is a rider capable of challenging for mountain victories again in the future, and could maybe even fight for yellow. Seeing FDJ directeur sportif Marc Madiot – a former Tour stage victor himself and twice winner of Paris-Roubaix – screaming at Pinot from the window of the team car in the closing kilometres was a magnificent sight. A very popular character, it was obvious what this win meant to Madiot and his small French team, who punch above their weight at the Tour de France every year. What’s more, a successful July will always please the sponsors, even securing the team’s future. Let’s hope this win is the first of many. Kessiakoff has a small consolation for missing out on the stage win – he has taken over the lead of the polka dot jersey by a single point. Sky’s Chris Froome remains in second place, with Cadel Evans two points further back in third. However, Sky won’t be wearing the controversial yellow helmets on tomorrow’s stage, with RadioShack-Nissan ironically taking over the lead in the team classification – this despite their awful season and Tour to date. Their Basque rider Haimar Zubeldia is the highest placed in the GC, 59 seconds behind Wiggins in fifth place. Belgian Maxime Montfort continues to impress in seventh. Sky looked slightly more fallible today than in their supreme efforts recently. After comparisons to Lance Armstrong’s dominating US Postal Service team, today they looked slightly weaker, with riders being dropped relatively early on in the stage. It is clear that if Bradley Wiggins is going to match the likes of Vincenzo Nibali and Cadel Evans in the mountains, Chris Froome will be vitally important. Rein Taaramae will continue wear the white jersey of best young rider tomorrow, with Tony Gallopin in second place. BMC’s Tejay Van Garderen has fallen down to fourth behind Pinot after losing time today, perhaps a cause for concern for Evans, given that the American has looked like his key domestique so far this Tour.